"Super fast delivery, item is perfect and as described, very pleased, thank you. 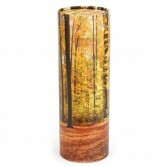 Shelley Laker"
The Cremation Urns Company offers a beautiful range of scatter tubes, specifically designed to distribute your loved ones ashes at any significant location. 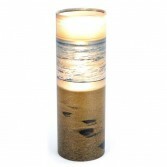 The scatter tubes are of the highest quality with beautiful peaceful designs around the whole tube. They also have replaceable lids with a push-in section, which once pressed in, acts a little like a spout that allows the individual to maintain control and proceed in a dignified way. 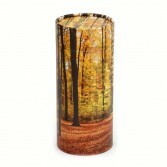 The Autumn Wood ashes scattering tube (small) is of excellent quality with a peaceful woodland scene covering the entire tube, and is specifically designed to make scattering ashes an easy and dignified procedure. 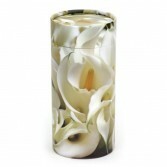 The Peace Lilies Scattering Tube (large) is of excellent quality with beautiful white lilies covering the entire tube, and is specifically designed to make scattering ashes an easy and dignified procedure. 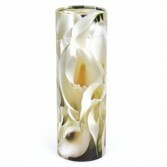 The Peace Lilies Scattering Tube (small) is of excellent quality with beautiful white lilies covering the entire tube, and is specifically designed to make scattering ashes an easy and dignified procedure. 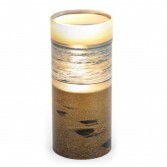 The Footprints In Sand Scattering Tube (large) is of excellent quality with a peaceful beach sunset with footprints design covering the entire tube, and is specifically designed to make scattering ashes an easy and dignified procedure. The Footprints In Sand Scattering Tube (small) is of excellent quality with a peaceful beach sunset with footprints design covering the entire tube and is specifically designed to make scattering ashes an easy and dignified procedure.